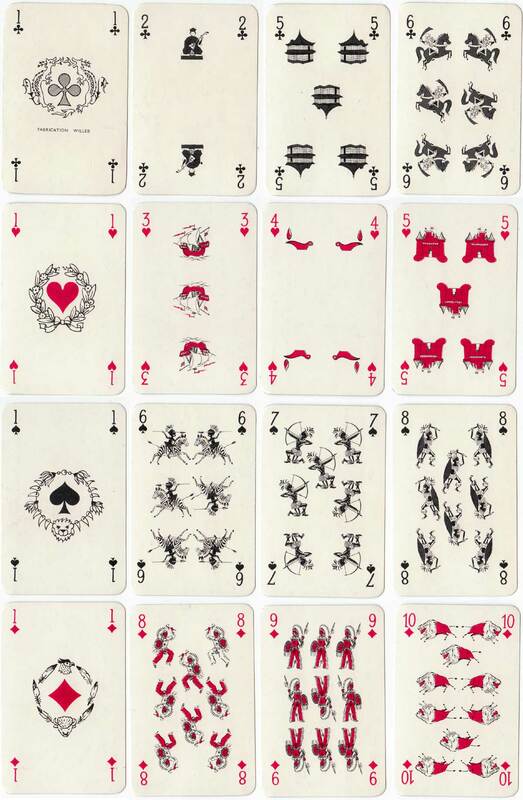 Jeu de Bataille card game published by Éditions Willeb, Paris, whose name appears on the ace of clubs. The non-standard court cards and numeral pips represent characters from different nationalities or ethnic groups who are presumably engaged in battle. These are : medieval European, native African, American Indian and Japanese. The cards are designed in the style of the French standard pattern with diagonal dividing lines between each end. Éditions Willeb, 13 Rue Marivaux, Paris, were book publishers since 1930s also published standard cards, tarots, children's card games, toys and puzzles. Above: “Jeu de Bataille” card game published by Éditions Willeb, Paris, ref no.1588. The back has a trellis pattern of blue crossed lines. Images courtesy Rex Pitts.